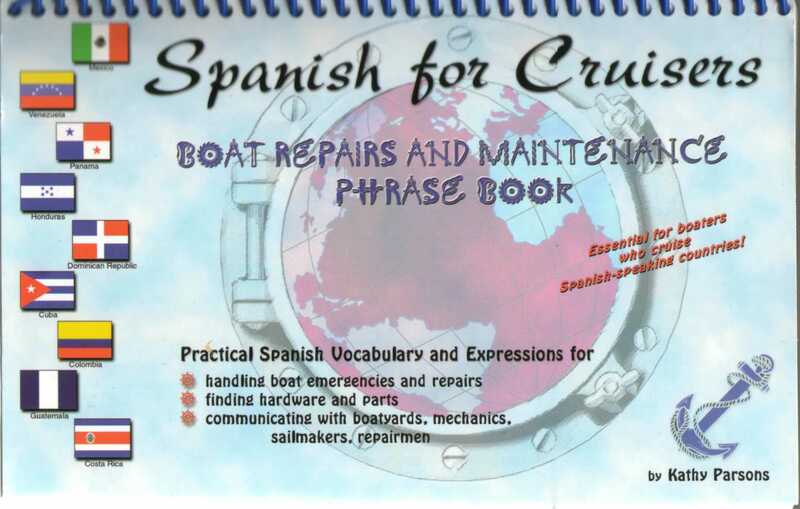 Spanish for Cruisers: Boat Repairs and Maintenance Phrase Book by Kathy Parsons. Aventuras Publishing Company, Hallettsville, Texas, 2000. 211 pp. Ah, its another lovely day cruising in the Caribbean, the sun shining, the birds chirping, the fish biting. The engine clunking? After investigating below you determine that repairs will be needed and head for the closest port, somewhere along the coast of Venezuela. Not a worry has crossed your mind, because in addition to all the provisions, spare parts, and emergency equipment you stowed away on board, right before leaving you picked up a handy little book called "Spanish for Cruisers: Boat Repair and Maintenance Phrase Book," by Kathy Persons. Recommended by many cruisers and Parsons' ex- Spanish students, you are sure that it will get you through those hairy moments when your five word Spanish vocabulary hits a wall. The odds are definitely in your favor if you were wise enough to add Spanish for Cruisers to your on board library. Take it from a native Spanish speaker who, despite having lived many years abroad in a Spanish speaking country, doesn't have the vocabulary necessary to carry on a conversation about gaskets or hose clamps. After looking at this easy to read and use book, its practicality, functionality and value was obvious. Its a great gift for yourself or any of your cruising friends or family. Spanish for Cruisers is organized in chapters ranging from the most basic Spanish pronunciation, basic conversation, numbers and money, and getting directions, to hardware, engines, parts, descriptions, electronics, boat parts and of course emergencies. It is jam packed with vocabulary and useful phrases, and every word on every page has its translation in Spanish and phonetic pronunciation. Even its spiral notebook format makes it easy to lay flat on a table between you and a mechanic where you can both look at what you are trying to say, while pointing at the detailed pictures of, a water pump, for example. All the words are also cross referenced in the index, so if you nee a specific word, you can turn right to it. Your typical phrase book doesn't cover the boat specific words that cruisers demand, which is why Parson's set out researching and writing this book. She has cruised and lived in several Spanish speaking countries, and has taught Spanish to boaters throughout the Caribbean. If you are looking for a good practical gift for that picky boater or cruiser, this is it. If you have been making excuses for yourself, of why you don't want to sail to a Spanish speaking country, now you don't have any!